Prepping to have your brand new, custom fabricated solid surface countertops installed is an exciting process. But for many people, the idea of having their countertops installed is daunting. We've collected some of our most frequently asked installation questions here and provided answers to help you get ready for your new countertops! Q: What should be considered when planning for my countertop or shower replacement? PLUMBING | You will need to consider replacing your sink, faucet, food disposal, and hot water dispenser. The seals for each can be damaged when disconnected (which can cause leaks). We will be glad to assist you with any new fixtures and include these in your project contract. However, if you decide to reuse any existing plumbing fixtures, we will make every effort to prevent damage during disconnection. However, we cannot be held responsible if any damage occurs. Reconnection of all plumbing fixtures is to be done after your new countertop or shower has been installed. Be prepared to have the water to your home (or at least the portion of your home that we are working on) shut off during and after the countertop or shower installation. The condition of the plumbing in your kitchen or bath will dictate what has to happen for the installation to proceed. A licensed plumbing contractor must perform plumbing connections. We will be glad to make plumbing arrangements for you. APPLIANCES | Now is a good time to consider whether or not to replace your cooking appliance. If you elect to reuse an existing cooktop, the new countertop will be cut to fit that appliance. If you decide to change your cooktop after the new countertops are installed, the countertop will probably require modifications or replacement, which will be an additional charge at that time. Some work must be done by another licensed professional. Cooking units that are wired directly will need to be disconnected and reconnected by a licensed electrician. Gas appliances must be disconnected and reconnected by a licensed plumber or appliance installer. The disconnecting of cooking appliances will need to be done before your existing countertops are removed and reconnection will need to be done after the new countertop is installed. Keep in mind that if we have to disconnected, we will turn off the circuit that controls this unit. REMOVAL OF EXISTING COUNTERTOPS | Existing countertops must be removed before installation can begin. We are glad to provide this service for you and include this in your project contract. If you elect to handle this yourself, the existing tops must be removed before our installers arrive with the new ones. Q: What is included in the purchase of my countertop/shower replacement? The quote you signed states your selections and the exact work to be performed. Only work that is specified in your quote is included. Anything not specified in your quote is not included. Please call us if you have any questions or concerns. Q: What happens after I have made the purchase of my countertop replacement? Countersync will work with you to schedule a measurement appointment and/or template appointment, if required, for your new countertops and/or shower. Once we have correct measurements, supplies, and information, your project is released for production. Production of your countertops and/or shower typically takes anywhere from 2-3 weeks depending on the material and complexity of the project. This is an estimate, not a guarantee. Once your countertops and/or shower are completed, we will schedule installation. Q: What do I need to know to prepare for the installation of my new countertops/shower? Once your countertops/shower have been fabricated, we will contact you to schedule the installation. Installation usually occurs on a weekday between 8am-4pm, excluding holidays. While every effort is made to complete installation the same day, complex installations might require you to be without the full use of your kitchen overnight. Be prepared for your home's water to be shut off during and after the countertop/shower installation. The condition of plumbing at the areas where we are working will dictate what has to happen. If you have not arranged for us to remove your existing countertops and to disconnect your plumbing fixtures and appliances, this must be done before our installers arrive. Please remove all items from your current countertop before our installers arrive the day of the installation. During installation, a substantial number of trips will be made from an outside work area to the actual work area. It is necessary to plan a path that the installer can use. The path must be sufficient in size for carrying large pieces of countertop without having to maneuver around tight corners. The installation of your countertops/shower may require the installer to trim the countertops/shower walls at the job site to ensure the best possible fit. These procedures are usually performed outside in a driveway. It is necessary that the homeowner provide such a place with ample coverage when the weather does not permit work outdoors. While most on-site fabrication is done outside the home, it may be necessary to do some in the actual work area. Q: If I plan to paint or wallpaper this area, when should this be done? Please wait to apply paint or wallpaper until after Countersync has completed your project install. Anytime a heavy and rigid countertop/shower is installed, some wall scuffing will probably occur as the installer works to ensure a good fit. Q: Do fixtures and appliances need to be on-site at the time of installation? Yes, it is important to have the faucet fixtures and appliances at the job site at the time of installation. Q: Could there possibly be any additional cost to me above and beyond the original project contract? Yes, if you request any changes or additions to the original project, proposal, and contract. There may also be an additional cost if any unforeseen issues arise, as in any remodel project. Any additional cost that may occur due to unforeseen issues can be handled by the homeowner or contracted with Countersync. Q: What type of finish should I expect on my countertops? All solid surface manufacturers, such as DuPont and LG, etc. recommend that their countertops have a lustrous matte finish. This is a nice finish with a beautiful sheen that will last for years to come. We are commonly asked if a high gloss finish is achievable. Our answer is yes, but we do charge an additional fee due to the additional time and labor this takes our fabricators and installers. This finish will need more upkeep and will not last. Since all solid surface products are non-porous, nothing is going into the surface. It's like waxing and polishing your car - to maintain that shine you have to keep polishing! Q: Upon installation, is there anything else I should be aware of? Yes, anytime a heavy and rigid countertop is installed, some wall scuffing will occur. We do everything possible to minimize this, but please be aware that some touch-up may be needed at the responsibility of the homeowner. Remember that this is a remodel of your home! Unforeseen problems can and may occur. We will not panic and neither should you, as we conduct numerous countertop and shower projects every year! You can trust us to complete the project to your liking and satisfaction! Every customer has survived, and you will too. Although remodel projects take you out of your daily routine and can be stressful at times, you can trust that you are working with experienced professionals! Project Serve at Lynndale, Inc.
Voted Best Countertops in the CSRA 2011-2017 in Augusta Magazine's Best of Home poll! 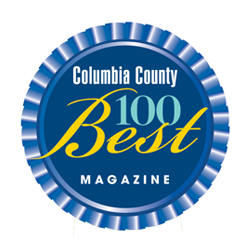 Voted Best Kitchen & Bath Remodeling by Columbia County Magazine 2015, 2016, and 2017! Our goal is to help you find the best fit for your space, your style, and your budget. In the showroom, we can show you what your options are and give you ideas on what to do with your space. We are constantly working to raise the bar on our services for the CSRA. Have you had a project completed by Countersync? Leave us a review! We are located just off Riverwatch Parkway between I-20 and Stevens Creek Road. Countersync was great to work with. They offered good suggestions, always professional, great product! We are very happy with our countertops. Thank you so much! Love my kitchen. Everyone involved was great. Am recommending them to friends. We love our countertops! They were above and beyond to do a great job! We have always referred them to others. Love our countertops and sink! We are very happy with our new countertops. Everyone who sees them likes them! Am very pleased with kitchen counter. Hoping one day to do a bathroom shower and cabinet. We love our counter tops. You did a great job. Very pleased with kitchen and bathrooms. Everything went very smoothly. We were very impressed with the professionalism of everyone we encountered. The installers did a wonder job and our countertops look great. We plan to use Countersync in the future to help us remodel bathrooms. We have done business with Countersync since its inception. There is no other solid surface fabricator in Augusta that provides the good price and great service like Bill Phillips and his team. We would highly recommend Countersync for all your solid surface needs. I have used Countersync for all of my Corian countertops over the past several years. The quality of the workmanship has been excellent. Any issues have been resolved efficiently and professionally. I would highly recommend Countersync to any other cabinet business for solid surfaces.